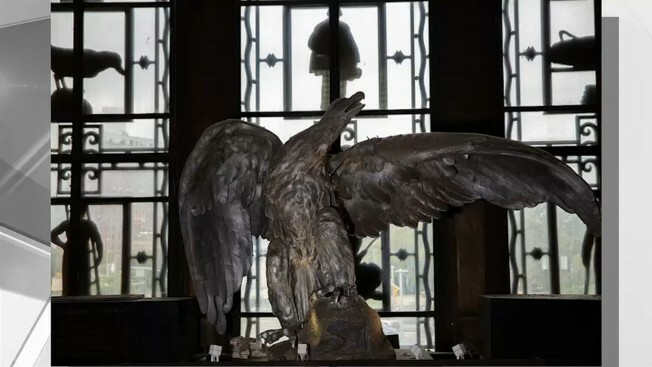 An eagle sculpture in the lobby of Brooklyn's Central Library has been dubbed "Ingersoll"
A decades-old eagle sculpture perched in the lobby of Brooklyn’s Central Library has a new name. The cast copper eagle has been dubbed “Ingersoll” — a tribute to Raymond Ingersoll, who was Brooklyn’s Borough President from 1934 to 1940, Brooklyn Public Library said Wednesday. Ingersoll pushed for the Central Library’s construction, calling the absence of a central library in Brooklyn “a great lack in the borough’s educational and cultural equipment [that] should not be tolerated in so great a community,” the library said. BPL launched a contest seeking name suggestions for the eagle this past fall. Members of the public cast their votes for five finalists at the end of last year. “Dodger” (for Brooklyn’s former baseball team), “Emily” (for Brooklyn Bridge engineer Emily Roebling), “Harmony” and “Winged Wonder” (taken from an inscription on the Central Library’s facade) were the other possible moniker choices. The eagle once sat on top of the former headquarters of the Brooklyn Daily Eagle newspaper, the library said. After the building was demolished, the sculpture was donated to the Brooklyn Historical Society. The historical society gifted the sculpture to the library last year. “Naming this majestic cast copper eagle after Former Borough President Raymond V. Ingersoll is a fitting tribute to the man who was crucial in the development of Brooklyn’s Central Library,” Brooklyn Historical Society President Deborah Schwartz said in a statement.